""Tommy trying to shoot coyotes, Big Springs Ranch. Oasis, Nev. 2012." For a long-term project on the American West, @lucasfogliaphoto documented the land and the people of Texas, New Mexico, #Nevada, Idaho, Montana and Wyoming. In his interactions with ranchers, farmers, mining employees and other locals, he learned to think outside the idea of "nomadic cowboys on horseback." 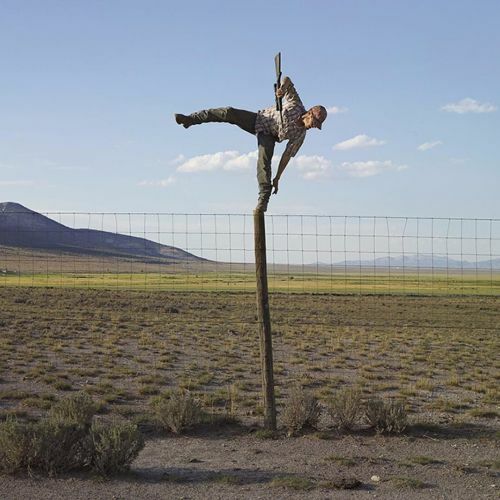 @lucasfogliaphoto spent day with Tommy, who asked, "'You want to see me shoot a coyote from the top of that fence pole?' " Moments later, Tommy fell off the pole with his gun loaded. @lucasfogliaphoto's work appeared on the #lensblog. More photos were released as a book, "Frontcountry," last year." By nytimes on Instagram.